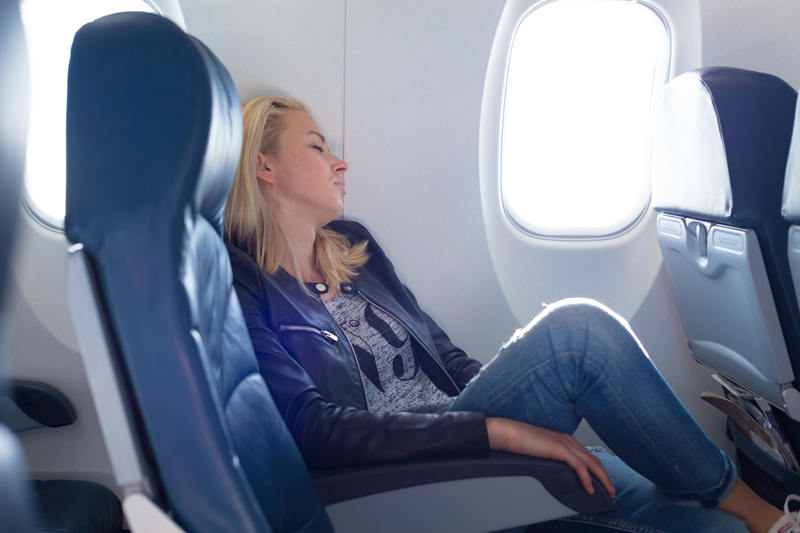 Traveling can be stressful, and it can become even more stressful when you learn that air travel can harm the body – your veins, to be exact. Each year, millions of people fly across the globe; this means hundreds of millions of legs are staying still for long periods of time, which idles the circulation. And it’s not just plane travel, if you spend extended periods of time in a car, bus or train, you can be at risk for blood clots, as well. When the blood flow slows down, legs can become achy and increases the risk of developing blood clots – this is also referred to as deep vein thrombosis (DVT). The more a person is immobile, the higher their chances are of forming a blood clot. DVT is a blood clot that forms within a deep vein, typically in the legs but they can also occur in other places in the body. Blood clots are dangerous, because they can block blood flow, especially when they enter an artery of the lung. This movement of the clot could be fatal, and it is a condition known as a pulmonary embolism. What Causes Blood Clots to Occur when traveling? Like stated before, immobility can cause blood clots to occur. However, according to the Centers for Disease Control and Prevention (CDC), the risk of developing a blood clot while traveling is small, unless you happen to have other risks known for causing blood clots, as well, like being over 40 in age, obesity, a recent surgery or injury, a previous blood clot, varicose veins, a catheter in a large vein, pregnancy, cancer, birth control or hormone replacement treatments. The more risks you have that cause blood clots, the more likely it is that you’ll form one. How Can I Prevent Myself from Developing a Clot While Traveling? If you have a high risk of developing a clot, especially if you have varicose veins, it may be in your best interest to wear compression stockings. Compression stockings are a special type of hosiery designed to relieve symptoms and slow the progress of various venous disorders, including varicose veins, venous insufficiency, and DVT. These stockings help improve circulation by using stronger elastics that create pressure at certain points in the legs, such as the knees, ankles, and feet. The stocking is tightest around the foot and get looser as it goes up the leg. They work by compressing the veins, muscles and arteries on the surface, forcing blood to flow through narrowing channels than normal. With a narrower blood flow occurring, there will be an increase of arterial pressure and more blood people returned to the heart, and less blood pooling in the legs and feet. These stocking can be worn easily under clothing. Try to stretch your legs, and move the position of your legs and body frequently, and as best you can. Stay hydrated. Drink plenty of water and avoid alcohol, warm liquids, or foods that can dehydrate you. Proper hydration keeps vein walls from narrowing. Perform calf raises in your seat. Get up and walk around every couple of hours, if possible. Make sure nothing is compressing your legs around you. Is Traveling After Vein Treatment OK? If you just had a vein surgery or treatment, it is best to consult with your doctor to decided when it’s OK for you to travel. For shorter trips and flights under two hours, most doctors would agree that 7-10 days after surgery is plenty of time. For longer trips, most doctors would suggest waiting a full month to travel. In general, developing a blood clot after any surgery is highest in the first month, which is why many doctors would tell most patients to wait the full 30 days. Each person and treatment is unique, so your doctor will know what is safest for you. Don’t be afraid to travel. There are plenty of options to reduce your risk of developing a clot while taking a long journey somewhere. If you think you may be at risk for developing a clot in your veins, speak with Dr. Zuzga at West Florida Vein Center today to discuss what preventative measures are right for you. To schedule an appointment, call 727-712-3233.